Is a Harvard MBA Bad for You? We suspect you won’t hear too much about this from the liberal mainstream media, or the environmental movement, or even Al Gore – but, according to the latest energy report from The Energy Information Administration (EIA), under President Trump, per-capita carbon dioxide emissions are now the lowest they’ve been in nearly seven decades. Even more interesting is the fact that US carbon emissions dropped while emissions from energy consumption for the rest of the world increased by 1.6%, after little or no growth for the three years from 2014 to 2016. The U.S. emitted 15.6 metric tons of CO2 per person in 1950. After rising for decades, it’s declined in recent years to 15.8 metric tons per person in 2017, the lowest measured levels in 67 years. And as The Daily Caller reports, in the last year, U.S. emissions fell more than 0.5% while European emissions rose 2.5% (and Chinese emissions rose 1.6% along with Hong Kong’s 7.0% surge), according to BP world energy data – an ironic turn of events given Europe’s shaming of Trump for leaving the Paris climate accord. Whereas several years ago, forecasting that central banks would unleash wars, bloodshed and social conflict was considered so preposterous, it was relegated to the domain of fringe, tinfoil hat blogs, it has gradually been “normalized” as even the mainstream realized just how clueless the world’s central planning elite truly are, and this scandalous topic has since migrated to the permitted list of items for discussion by respected, establishment institutions including banks and wealth managers, such as the UK’s Clarmond Wealth. The cost of these policies, like in Takahashi’s time, is being paid years after the event. QE and deficit spending has brought unexpected and unsavoury guests to the political dinner table, invited there by the angry electorates. In 2012 we did not know who they would be in 2012, now we do and the guest list is nearly complete. These couplings are the costs of QE’s best intentions. These new guests bring with them their outlandish ideas to our desperate mainstream, that is struggling to find a vision of the future. Below we repost the full Clarmond note which just a few short years ago would have prompted scandalous outrage across the “very serious people’s” world of finance, and now is more or less considered common knowledge as to how “this” all ends, and hardly generates any reaction. In preparing for my annual pilgrimage to the wifi-free valleys of the Cevennes National Park in France I have been reviewing our old pieces to remind me on what we were thinking in the past. One piece written in November 2012 jumped out at me, we called it ’Resurrecting Reflation’. In it we introduced Takahashi Korekiyo, finance minister of 1930s Japan. He combined massive Quantitative Easing with deficit spending to propel Japan out of its slump. The result…the equity markets tripled, employment soared, and inflation decreased. Sadly for Korekiyo he paid for this easy money with his life. The loose money went into the military and when he tried to turn this tap off the group of army thugs visited him and cut him to pieces. In 2012 it was only Ben Bernanke who was engaging in serious QE and we suggested that we should not be surprised to experience a similar outcome. Well Draghi, Kuroda and Carney soon joined the party and what a ride we have had. We have enjoyed a significant rise in asset prices, be they in equities, fixed income, or real estate. However, this has coincided with continued stagnation in income – and this rise in asset prices has only highlighted the disparity between income and asset growth. So resentment has simmered in the electorates of the developed world. Our guest include those on the edge of acceptability; the kind of characters who have provided diversionary entertainment for decades. These are now the main guests, sitting on both the Left and Right sides of our table: Trump & Bernie, Jacob & Jeremy, the Europeans leaders of AfD, Podemos & LegaNord. These couplings are the costs of QE’s best intentions. These new guests bring with them their outlandish ideas to our desperate mainstream, that is struggling to find a vision of the future. The fringe is now in charge because the centre is bankrupt of ideas. If we fast-forward another 5 years from now I only see this guest list expanding, all the while the central bankers silently attempt to skulk away. In the past both parties eventually collided, with the new guests prevailing. So I despise these virtue-signaling open-borders imbeciles. 3) As a Christian Lebanese, saw the nightmare of uncontrolled immigration of Palestinians which caused the the civil war. & as a part-time resident of N. Lebanon, I am seeing the effect of Syrian migration on the place. Bears and bulls alike following Tesla’s gripping nailbiter of a story – the company has until the end of the month to pump out 5,000 Model 3 sedans a week – both agree on one thing: the output of the company’s new “tent” structure which Musk erected recently to produce Model 3 vehicles is going to decide whether or not the company hits its production goal that it has touted over the last couple of months. The tent was erected in just a matter of weeks, and came online in early June, to help the company produce more vehicles at a time when they are under the microscope. Until recently, we didn’t know the details as to when it was erected, what the timing looked like and what it is expected to produce. However, a Bloomberg article out today helped shed some light on the details of what is arguably the most important – if archaic – structure that Tesla has built yet. Elon Musk has six days to make good on his pledge that Tesla Inc. will be pumping out 5,000 Model 3 sedans a week by the end of the month. If he succeeds, it may be thanks to the curious structure outside the company’s factory. It’s a tent the size of two football fields that Musk calls “pretty sweet” and that manufacturing experts deride as, basically, nuts. Inside the tent in Fremont, California, is an assembly line Musk hastily pulled together for the Model 3. That’s the electric car that is supposed to vault Tesla from niche player for the wealthy to high-volume automaker, bringing a more affordable electric vehicle to the masses. Analysts at Bernstein are equally unimpressed. Here is a quote from Max Warburton who benchmarked auto assembly plants before his job as a financial analyst: “Words fail me. It’s insanity,” said Max Warburton, who benchmarked auto-assembly plants around the world before becoming a financial analyst. Ironically, Musk’s “Hail Mary” is the polar opposite of Tesla’s own vision for its future of state of the art robotics, hermetically sealed manufacturing facilities and millisecond efficiency. To be sure, the tent is also a far cry from the automation that investors were promised during the early days of Tesla. The company‘s goal, which once was to have a state of the art factory producing vehicles, has now been reduced to a literal tent using manual labor and spare parts to put together cars. Worse, nobody seems to even know whether or not the line is up and running. Welcome to the future? Musk announced it on Twitter on June 16, saying the company had put together an “entire new general assembly line” in three weeks with spare parts; the building permit was issued on June 13, though the company could have started working on aspects of the project before that. Whether this new line is fully operational is unclear. Company officials declined to comment. The Tesla-obsessed users of Twitter and other internet forums have posted photos and videos and comments either praising or ridiculing the parking-lot big top. Apparently in response to the intense interest, the tent has recently been surrounded by very large trucks, which obstruct the view. What gives manufacturing experts pause about Tesla’s tent is that it was pitched to shelter an assembly line cobbled together with scraps lying around the brick-and-mortar plant. It smacks of a Hail Mary move after months of stopping and starting production to make on-the-fly fixes to automated equipment, which Musk himself has said was a mistake. As Bloomberg notes, an April admission that he erred by putting too many robots in Tesla’s plants was a humbling moment for Musk. The chief executive officer had boasted in the past that his company would build an “alien dreadnought,” sci-fi bro code for a factory so advanced and robotic, it would be incomprehensible to primitive earthlings. During a February earnings call, Musk told analysts that Tesla had an automated-parts conveyance system that was “probably the most sophisticated in the world.” But by the spring, it had been ripped out of the factory. The article concludes with what may be the most suitable epitaph for Tesla should Musk disappoint in a few days when he reports Q2 production figures. “It’s preposterous,” Bernstein’s Warburton said. Preposterous or not, the clock is ticking on Tesla. When you go around claiming that central bankers don’t know the first thing about money, people tend to think you are crazy. It’s not really their (people’s) fault. Not only have we been conditioned to believe in a technocracy of sorts, it is raw human nature to immediately suspect such a radically contrarian view. It would be one thing to say, well, central banks screwed up and were behind, making a few big mistakes along the way and we had the pay the price for it. Even that would be hard for some to really accept. But to make the indictment that they really don’t know what they are doing even on the most fundamental level just cuts way too deeply against convention. Your natural instinct is to believe there is no way that could possibly be true. Yet, if you actually take the time to listen to what they say, and have said in the past, they do admit as much. It’s never summarized in that fashion, of course, and any potentially negative implications are downplayed or dismissed. 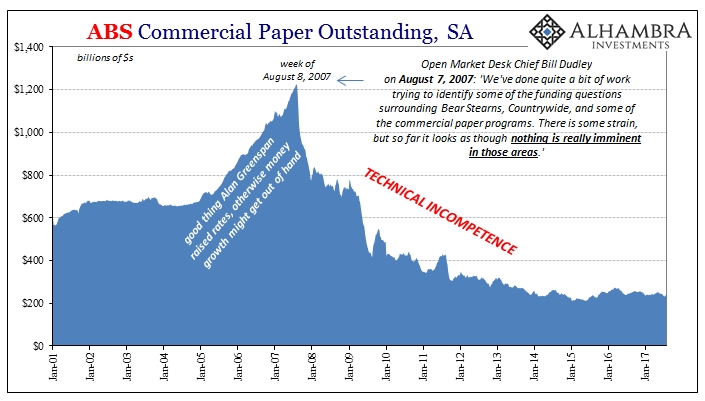 Since the Great Inflation monetary policy has been quite intentionally stripped of money. Banks evolved and there was really no easy way to define money beyond a certain point (in the sixties), so Economists just gave up trying. This is no small thing, but in Economics it is treated trivially. Around the same time, Positive Economics, or econometrics, came into its own. It was widely accepted as one possible answer to a lot of academic problems. Rather than being forced to study incessantly the dizzying complexity of any economic system, econometrics offered a short cut. Define a few big correlations and that was all that was required. But first, Economists had to solve markets. Before the seventies, most mainstream econometric models tried incorporating an “adaptive” expectations regime. This assumes that economic agents, including those operating in any financial markets, are always backward looking, forming their expectations from only past conditions and data. Not only was it a theoretical problem, it was also a mathematical one leading to incomplete regressions and equations riddled with infinities. John Muth began the trend toward “rational” expectations, a journey ultimately completed by Robert Lucas (and Thomas Sergeant). The singularities disappeared from the math and efficient markets were born. No need to try and understand how markets form expectations and prices, Economists will just assume they use all available data and work themselves out efficiently to the best forward-looking position. Once you’ve made such assumptions, what use to further study markets and therefore credit-based money? The modern central bank model was complete in its stunningly arrogant simplicity. It need only push around a single money rate and from there it actually expected to control the marginal variations for the entire economy. It didn’t know how or why, it just expected from that single input predictable outcomes would result. What these neo-Keynesian DSGE models “knew” about money and finance was nothing other than simple maturity transformation: the central bank lowers (or raises) the money rate, that steepens (flattens) the asset yield curve as desired, making it more (less) profitable for depository institutions to make additional loans, therefore banks stimulate (retard) additional economic projects. But what if the biggest source of credit doesn’t originate from depository institutions? And what if these other financial agents use very different sources of “money” and funding? Greenspan worried about the “proliferation of products” banks were substituting for traditional money, little did he know it was a proliferation of a proliferation. In public, these questions appear to be all but forbidden. No Federal Reserve official has ever been made to answer them. In private, as noted so many times before, they did particularly Alan Greenspan who fretted about such grand ignorance, but for the rest of us we are supposed to be content with this shockingly incomplete basis for a purported technocratic enterprise of still some great esteem. Mario Draghi, for example, says in 2018 there is no evidence that European inflation after years of QE is about to breakout, but he believes it will anyway because of QE and so his belief is written as truth at the direct expense of years upon years of contrary evidence. As I’ve also written, what is so disheartening about these small economic upswings like the one we are experiencing now is that they all but erase the public’s curiosity about these big questions and more importantly the urgency to try to get someone to answer them. In 2015 and early 2016, in particular, the trend was very much in the right direction. Policymakers were openly nervous and uncertain; it was palpable at times. Everyone could see that “something” was missing, and that something was a big deal. Now? Nobody cares (again) – at least until the next one. FRBNY President Bill Dudley is retiring. In addition to holding the most important post at the most important branch, before that he was the head of the Open Market Desk during the most consequential nineteen months in modern economic history. There is a reason why I quote him most for the crisis period, the same reason he, like Bernanke, is already starting to try and reshape his legacy. So economists may be a little bit more open-minded to the facts—not to say that lawyers aren’t, but a lawyer’s job is to do something, to advocate a position, to protect a positon [SIC]. So they’re starting with a very strong a priori view. I think economists start with a priori views, in the form of a hypothesis, but if the evidence is inconsistent then they start to change the theory and hypothesis, as opposed to arguing that the evidence is obviously not applicable. You don’t get four QE’s if this was in any way true. You just don’t; one was enough of an experiment. Two maybe to test a different variable, but after what happened in 2011 the whole paradigm of bank reserves would have been tossed into the East River if these were anything like faithful scientific principles. Dudley follows that up with some examples, casting himself in the role of the scientist though careful to construct his new narrative so that his evolving position is never anchored to any big, historic events in the recent past where such evolution might have instead proved beneficial. All you are supposed to know is the he is learning, not pay attention to when or how it might be way, way too late. Historically macroeconomists imagined that changes in federal funds were transmitted directly from the Fed to the macroeconomy. But in my mind, the linkage between the federal funds rate and financial conditions is quite variable. So if you just focus on the federal funds rate, you’re going to, at times, make pretty bad forecasts about what’s actually going to happen in the real economy. This is where the Fed’s push toward limited transparency is going to, ironically, haunt them for decades. He can claim what he does above, but it’s all there in the transcripts directly contradicting him. As head of the Open Market Desk, he truly believed, as the global monetary system came crashing down around him, that big cuts in the federal funds rate would make everything better. They all did because they just assumed it (maturity transformation) worked that way. In addition to the above, Dudley makes another stunning admission because, again, he is retiring and transparently wants to start rehabilitating his reputation. One of the challenges going into the financial crisis, for example, if you look at the big DSGE model—dynamic stochastic general equilibrium model—it didn’t include a finance sector. So the whole experience of what actually happened during the global financial crisis—the collapse of the financial system and that taking down the real economy—wasn’t an actual possibility within the major macro models that some economists were using to forecast the economy. The problem with trying to claim “it’s the models fault” is, again, the transcripts. Starting with the association of “some economists were using”, we are supposed to believe that he isn’t included in that group. He most certainly was. The FOMC followed the Greenbook and other modeled assessments as their forecasting gospel. It’s why as late as July and August 2008 they were still thinking that through their own skill in handling the crisis to that point, largely Bear Stearns, the US economy might even manage to steer clear of any recession – even though one had already begun the prior December (unbeknownst to rational expectations theory) and by that summer had already experienced the first rumblings of collapse. The real issue is why Bill Dudley is talking about all this now rather than in, say, 2011. In January of that year, FRBSF researchers published a paper totally exposing the economic illiteracy this doctrine of shortcuts demands. What you see above taken from that paper is exactly what policymakers expected to happen vs. what did happen that they thought was impossible (almost all the red lines in all the modeled runs were more than six standard deviations from projections). Bill Dudley, on the verge of retirement, admits to you now a decade later what could only have been helpful more than eleven years ago. They really don’t know what they are doing. They never have. FRBNY’s outgoing president unintentionally highlights both of our major problems, each relating to Economics as an ideology rather than scientific pursuit. First is this rule of principled ignorance. In econometrics, the math is all that matters when instead there are very real circumstances where we might wish to understand why the math might not matter at all. Substituting statistical competence and comprehensiveness for on-the-ground understanding of, you know, an economy is a potentially fatal blindness. It sure was starting on August 9, 2007. The second gets back to the first of Dudley’s quotes above. Economists never deviate from their models. These statistical constructions are treated like they are their children. They start with a hypothesis constructed from them and stick with it no matter what as if the models themselves can never, ever be wrong. Economists are irretrievably devoted to the math, or the economy that “should be.” These models made the biggest of all big mistakes and still they persist as if they are in any way useful. Yet, it still sounds preposterous to most people when you write or speak about how there is no money in monetary policy and how Economists don’t know the first thing about the economy. It is important to pay attention to when they actually admit it and to broadcast the confession as far and as wide as possible especially during another limited upswing before one lost decade turns to a second and what then might happen as more of the impossible. Indeed, as we noted last week, several politicians suggested at the end of May that the ECB was exacerbating the sharp market moves: “It would be useful to know how much debt the Bank of Italy and the ECB have bought compared to the norm? Have purchases gone down?” tweeted Carla Ruocco, a Five Star MP, at the peak of the market turmoil last week. As shown below, in total less than 15% of ECB’s net May purchases were of Italian debt, the lowest proportional allocation to Italy since the bond-buying program began in March 2015. And with relative Italian purchases tumbling, some other nation must have seen its bond purchases jump. It will come as no surprise to anyone, that someone was Germany, which as the chart below shows, saw its net ECB purchases of bonds as a % of total soar to the highest since the program began. Of course, any hint the ECB is intervening in markets to push for a specific political outcome, even though it did precisely that in November 2011 when a crash in Italian bonds led to the ouster of then-PM Sylvio Berlusconi, would lead to a huge European scandal in which the “apolitical” central bank is seen as intervening in domestic politics, and the bank came out prepared with a statement “explaining” precisely why Italian purchases tumbled, and to deny Castelli’s allegations that the ECB’s QE was being weakened “at exactly the moment when we need it strengthened to secure the stability of the EU” just to punish Italian voters who picked a populist government. Yes, but no other nation saw its share drop as much as Italy; a plunge which certainly exacerbated the low liquidity liquidation that sent “lo spread” above 300bps. Indeed, but again on a relative basis, they plunged, and that’s all that traders in Europe – where nations pretend to be at least relatively equal – cared about. Incidentally, as we reported last week, the ECB said that it was watching political events in Italy but was unlikely to intervene by buying debt. Well, it clearly did intervene by purchasing debt… of Germany, much to Bill Gross’ chagrin, as the relative outperformance of Bunds over US Treasurys led to the biggest one day loss for Bill Gross’ unconstrained fund. And while the Italian bond crash has been put on hold for now, the far bigger question remains: what happens to this artificially supported bond market, in which politicians scream bloody murder when the ECB tapers its purchases even modestly, when the ECB fully ends its QE and stops monetizing public debt as it is widely expected to do on January 1, 2019? Following the news that the ECB had purchased fewer Italian bonds in May, the FTSE MIB slumped to session lows, with Italian banks following suit as Italians are given a stark reminder just how precarious the price of every single asset in the country is without the continued support of the ECB. Borghi, is of course, correct – we first discussed this last December in “Italian Bonds Slide As Market Realizes ECB Has Been The Only Buyer“, but the obvious next question is: so what? Yes, Italian bonds are massively mispriced and they will plunge if and when the ECB stops supporting the market, in effect holding Italy hostage. As for the biggest question, it is what if anything, Rome has up its sleeve to avoid such a fate when Draghi’s QE finally ends. After several attempts by Congress to restore the OIG’s investigative powers, Rep. Jason Chaffetz successfully introduced H.R.6450 – the Inspector General Empowerment Act of 2016 – signed by a defeated lame duck President Obama into law on December 16th, 2016, cementing an alliance between Horowitz and both houses of Congress. On September 26, 2017, The House Judiciary Committee repeated their call to the DOJ for a special counsel, pointing out that former FBI Director James Comey lied to Congress when he said that he decided not to recommend criminal charges against Hillary Clintonuntil after she was interviewed, when in fact Comey had drafted her exoneration before said interview. 21) #Comey‘s Lies are catching up to him. With Trump set to unveil his vision for lowering drug prices as part of his “American Patients First” initiative, moments ago the Department of Health and Human Services released a blueprint plan on drug prices. Leveraging the Competitive Acquisition Program in Part B. Of course, if Trump is indeed serious in his crackdown on pharma and drug companies, then the record IRR pharma companies reap through lobbying is about to crash. Keep an eye on lobby spend to determine if Trump’s plan is just more fluff or has some hope of actually working. Join Greg Hunter as he goes One-on-One with CIA whistleblower Kevin Shipp, founder of the website ForTheLoveofFreedom.net. Jeff Bezos, the world’s richest man, has made Amazon shareholders extremely wealthy and happy in recent years, but when it comes to Amazon’s 566,000 employees, it’s a vastly different matter. Last week, Amazon finally disclosed its workers’ median annual salary, which at a paltry $28,446 put Amazon on par with Hershey, slightly above retailer Home Depot, and almost ten times below the $240,430 median annual comp at Facebook, according to recent proxy filings. This will hardly come as a surprise: after all, most of the roughly half-million blue-collar, part-time employees at Amazon don’t make six figures while spending their workdays writing code, and instead unload trucks, drive forklifts and walk miles collecting products to fill orders—all for around the same pay as workers in other companies’ warehouses. Due to their menial, repetitive task, they are also rapidly being replaced by robots. According to Bloomberg, around 350 Amazon workers, members of Germany’s powerful Ver.di trade union, gathered outside the office of tabloid publisher Axel Springer where the awards ceremony was taking place, carrying posters demanding to “Make Amazon Pay.” The union has been pushing for higher pay for Amazon’s thousands of workers in the country for several years, claiming they receive lower wages than workers in other retail jobs. Amazon workers from other countries, including Poland and Italy, also traveled to Berlin to join the protest. In a dramatic description of Amazon working conditions, Verdi boss Frank Bsirske said that “we have a boss who wants to impose American working conditions on the world and take us back to the 19th century.” Ver.di has for years been a constant thorn in Amazon’s side in Germany, organizing workers strikes to demand improved pay and working conditions according to Bloomberg. One of the protesters at the event was Thomas Rigol, 37, who joined Amazon as a logistics worker in Leipzig in 2008. Rigol says he would like Bezos to give unions a say in the company, and increase profit sharing opportunities for workers. The protest took a political turn, when Andrea Nahles, the new leader of Germany’s Social Democrats which is in coalition with the ruling CDU, turned up at the protest, and also had harsh words for Bezos, telling reporters that he didn’t deserve his prize since he treats his employees badly. Amazon employs some 16,000 people in Germany, its biggest market outside the US. Later, during a fireside chat with Axel Springer CEO Mathias Döpfner on Tuesday evening, Bezos defended Amazon saying he was “very proud of our working conditions, and I’m very proud of the wages we pay,” including in Germany. It was not immediately clear if he discussed his unstated desire to replace all low-paid warehouse workers with zero-paid robots over the next several years. Separately, when asked a question about whether he was concerned Trump would try to break up Amazon Bezos said he expects to be scrutinized. “The big tech companies have become large enough that they’re going to be inspected,” Bezos said. “It’s fine.” In other words, the world’s richest man is not all worried about the actions of the world’s most powerful man.